Last week, an appeals court in the Netherlands sentenced Guus Kouwenhoven, a Dutch businessman and citizen, to 19 years in prison for serving as an accessory to war crimes in Liberia. For years, Kouwenhoven smuggled weapons into the African nation using his timber business as cover. His operation supplied Liberian war criminal Charles Taylor with weapons for use in a conflict that claimed hundreds of thousands of lives. Kouwenhoven’s conviction comes seven years after an ICTJ report called on Liberian officials and civil society to initiate litigation against the corporate entities that fueled the conflict. Our analysis encouraged activists to pursue cases in other jurisdictions, citing the case of South African activists pursuing criminal accountability in New York City against corporations that profited from apartheid. Likewise, the Liberian Truth and Reconciliation Commission (TRC), in consultation with ICTJ, recommended that foreign jurisdictions hold businesspeople accountable for crimes committed in Liberia. The TRC’s report even named Kouwenhoven specifically as a target for such charges. My ICTJ colleagues and I worked closely with the TRC in formulating these recommendations, and the Dutch court’s decision is built on many of the same facts established by the TRC. The recent conviction in the Netherlands is indeed an important victory, one that highlights the importance of “following the money” in cases of massive human rights violations. Here is what the conviction tells us about pursuing justice in both Liberia and beyond. The Global North has a significant role to play in pursuing justice in the Global South. The role of the Global North extends beyond simple support of ad-hoc tribunals like the International Criminal Tribunal for the former Yugoslavia (ICTY), or International Criminal Tribunal for Rwanda (ICTR), or the Extraordinary Chambers in the Courts of Cambodia (ECCC). Countries must hold people within their jurisdiction accountable, as well as those who enjoy the kind of legal protections or corporate structures that exist in the Global North. The Dutch court has set a very good example in convicting Kouwenhoven and prosecuting him over the course of years. That is the kind of determination that justice for economic crimes requires, and it is exemplary for other countries, whether in the Global North or South. Those “most responsible” for atrocities are not always the ones giving orders to kill or harm. As international criminal justice evolved from special tribunals to the International Criminal Court (ICC), it often organized itself around the notion of pursuing the person or persons “most responsible” for serious crimes. This is commonly understood as the leadership of an armed group, or those in control over combatants—basically, the people giving orders. In many ways, that is in fact a narrow notion of criminal accountability: you often find people who are just as responsible for the violence as the leadership, if not more so, because of their role, their function, or their motivations. Business and profit is a motivation to commit crime. And in this case, the crimes committed are war crimes and crimes against humanity, so that Kouwenhoven and Charles Taylor could profit from exporting natural resources from Liberia. International criminal justice is limited in that corporations—who are not human beings but whose operations can in fact drive war and exacerbate conflict—cannot be held accountable in a criminal trial. Whether that should mean expanding criminal accountability for the most serious international crimes to include corporations or strengthening the means to hold corporations accountable in other ways, it is an issue that should be explored. Kouwenhoven’s conviction is a good foundation for meaningfully expanding how accountability for corporate complicity in international crimes is pursued. 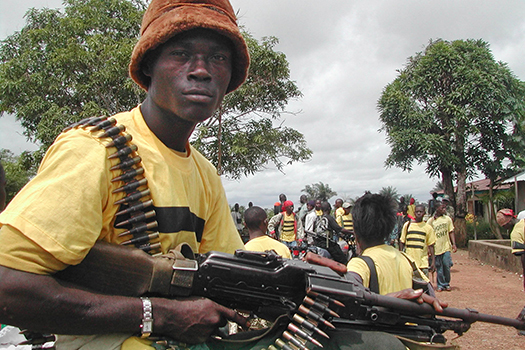 The conviction could reopen the discussion on transitional justice in Liberia. During the Liberian TRC hearings there were a significant number of activists who were just as determined to support truth-seeking efforts to expose economic crimes as they were to shed light into the violence that had taken place during the conflict. Kouwenhoven’s conviction will possibly renew the determination of some of these Liberian activists into not only pursuing accountability for economic crimes but perhaps even pursuing the implementation of all the other recommendations of the TRC, many of which have languished without concrete action for years, and were further forgotten during the country’s efforts to deal with the Ebola-virus health crisis. With elections looming, this case re-opens an opportunity for Liberians to examine the truth commission report, see what parts of it can be brought up during the upcoming presidential election in October 2017. It is unclear whether the conviction will provide redress for Liberians. While Charles Taylor was previously convicted of war crimes in Sierra Leone and through a national reparations program some of his victims in that country were awarded reparations, his victims in Liberia have received no such redress. It is important for either the Liberian government, or for those supporting justice for victims in Liberia or even Sierra Leone, to find out what evidence the Dutch court holds in regards to where Kouwenhoven’s criminally-derived assets are located and how much they are worth. This, too, is an opportunity for Liberian activists and international justice and accountability defenders to see whether Kouwenhoven’s assets can or have been frozen and whether Dutch authorities are mindful of examples from elsewhere in which ill-gotten assets of those linked to massive human rights violations have been used to fund reparations for victims of those violations. These instances include the family of Ferdinand Marcos in the Philippines, Alberto Fujimori in Peru, or most recently Hissene Habre of Chad. That Kouwenhoven isn’t a government official should not be the decisive consideration—he funded and profited from the violations committed by an authoritarian ruler and convicted war criminal. This is important because there has been no reparations program in Liberia. This is a government that has been forced to allocate its limited resources to address the Ebola epidemic. It is a government that still must deal with the lack of the most basic social services. While it cannot use that as an excuse to not try to find a means to provide reparations to the hundreds of thousands who were victims of the war, recovering ill-gotten assets earned from Liberia’s natural resources to provide redress for victims is clearly a meaningful and just step forward. This case holds lessons for other countries that endured economic crimes. Kouwenhoven’s case took years to litigate and prosecute, and the crimes themselves occurred decades ago. Justice is slow. But if you do not address economic crimes of the businesses and political leaders who are partners in the commission of these economic crimes, if you don’t hold businesses just as accountable for violence as you hold a warlord like Thomas Lubanga, the cycle will continue as it has in the Democratic Republic of Congo (DRC). This is also true in other countries in which unlawful resource extraction drives or worsens the commission of human rights violations by armed groups and authoritarian regimes.